After briefly considering retirement in 2012, Mike Brown (26-8 MMA, 2-3 UFC) is ready to get back to action. The former WEC featherweight champion meets Akira Corassani (11-3-1 MMA, 2-0 UFC) at UFC on FOX Sports 1 1. UFC officials today announced the new booking. UFC on FOX Sports 1 1, takes place Aug. 17 at TD Garden in Boston and will mark the promotion's debut on the new cable network, which launches the same day. The evening's headlining bout has yet to be announced. A middleweight matchup between "The Ultimate Fighter 17" contestant Clint Hester (8-3 MMA, 1-0 UFC) and "The Ultimate Fighter: Brazil" winner Cezar Ferreira (5-2 MMA, 1-0 UFC) is official for UFC 163. UFC officials recently announced the matchup. Additionally, a previously reported light-heavyweight contest of Vinny Magalhaes (10-6 MMA, 1-3 UFC) and Anthony Perosh (13-7 MMA, 3-2 UFC) was also made official for the card. Miesha Tate surprised women's bantamweight champ Ronda Rousey when she showed up on "The Ultimate Fighter 18" set. But the ex-Strikeforce champ got a surprise of her own when she heard Kim Winslow may be overseeing fights on the reality show. The UFC has decided to raise the marijuana testing threshold for the events they self-regulate, following WADA's decision to do the same. Welterweight contenders Martin Kampmann and Carlos Condit will headline the second UFC event on FOX Sports 1, FOXSports.com learned Friday. The five-round main event at Bankers Life Fieldhouse in Indianapolis will take place on Aug. 28. Tickets go on sale June 14. 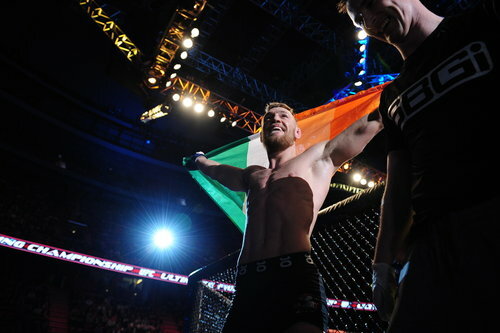 Two overseas fighters will travel across the pond to face off at the UFC on FOX Sports 1 debut this August as popular Irishman Conor McGregor will face off with England's Andy Ogle in a featherweight battle. Bellator MMA announced on Friday afternoon that they have signed Bubba Jenkins to a long-term promotional agreement and he will make his debut with the organization this summer. Jenkins will not be thrown into a tournament immediately as he will be given a number of fights before being placed into a tournament. Oh no, the injuries will not stop. This time John Makdessi is out of his scheduled fight with Edson Barboza at UFC 162. Following an impressive run of knockouts on The Ultimate Fighter Season 18, Uriah Hall will try to rebound from a loss in the finale when he returns to action at UFC on Fox Sports 1 on August 17 in Boston. Hall will square off with fellow Ultimate Fighter alum Nick Ring in a battle of stand-up fighters according to UFC officials who announced the fight late on Thursday evening. UFC welterweight James Head will donate his next fight's earnings to the Oklahoma tornado relief effort. UFC middleweight contender, Costa Philippou has left Team Serra-Longo to train at Bellmore Kickboxing Academy, as first brought to the attention of our own, Steph Daniels in her interview with Matt Serra. UFC Hall of Famer Tito Ortiz (16-11-1 MMA, 15-11-1 UFC) takes a deep breath before he answers. Long one of the most outspoken men in the sport of MMA, Ortiz briefly considers just how much he wants to reveal. But as he weighs the reality staring up at him on a computer screen, he decides to go all in. "I wasn't going to talk about it, but my kids are down for a nap right now," Ortiz told MMAjunkie.com (www.mmajunkie.com). "I just took an hour nap, myself, because I get up at 6 a.m. every morning, and I take care of these kids Monday through Saturday. I have a nanny that comes in and helps me because Jenna doesn't want to be a mom. She has a problem, and I don't want to bash her because she's the mother of my children. But I've tried to help somebody for the last seven years. I tried to make a family, and it's hard to do that when somebody else doesn't want to contribute. I just look at as I can't help somebody that doesn't want to be helped. She can try and bash me as much as possible. The only thing it's hurting is my children." After a four-year absence, Thales Leites (20-4 MMA, 5-3 UFC) is once again a UFC fighter. The onetime middleweight title challenger is slated to return to the octagon at UFC 163 against up-and-comer Tom Watson (16-5 MMA, 1-1 UFC), according to UFC officials, who confirmed the matchup to MMAjunkie.com (www.mmajunkie.com) following a report on Tatame. UFC 163 takes place Aug. 3 at HSBC Arena in Rio de Janeiro. The event's pay-per-view main card includes a featherweight title headliner between champion Jose Aldo and Anthony Pettis. Preliminary-card bouts serve on FX and Facebook. It's unknown whether Leites vs. Watson will serve on the main card or prelims. According to Dave Meltzer, the UFC is working on putting together what could be their biggest event in promotional history this fall in Dallas at Cowboys Stadium. The show would have two huge fights on top. Meltzer has the scoop: Nothing was said as far as when or where the match will take place. There is an idea floating around to try and put on the biggest show in company history at Cowboys Stadium in Dallas this fall. Several things would have to fall into place for this to happen, the key being Anderson Silva retaining the middleweight title against Chris Weidman, and not being banged up in the process. In addition, Jon Jones would have to be recovered from his own toe injury, and UFC would have to work out a deal to get the two of them to fight. Each has his own reasons, but neither has exactly clamored to fight the other. Having all those things fall into place makes this very much a longshot of actually happening. The idea would be to have Silva vs. Jon Jones and Velasquez vs. Dos Santos at the stadium, in October, at the same time as the state fair of Texas, perhaps on 10/12 or 10/19. That much is known to be at least something talked about. With Madison Square Garden seeming more and more unlikely for November, this show could be billed as UFC 20th anniversary show, with the idea of trying to repeat the success of UFC 100. Australian fighter Soa Palelei was forced off the UFC 161 fight card after last week's reshuffle of the card however Fight News Australia can reveal through a reliable source that negotiations are underway for Palelei to face undefeated Ukraine youngster Nikita Krylov (pictured). UFC officials are yet to confirm the match-up. Palelei was scheduled to meet Stipe Miocic at UFC 161 before Miocic got the call-up to face Roy Nelson on the main card, leaving Soa Palelei without a fight. Palelei will now have to wait a bit longer for his UFC return with the match-up against Krylov likely to be part of the UFC 164 card which is scheduled to be held at the BMO Harris Bradley Arena in Milwaukee, Wisconsin, USA on August 31. Former UFC champion Tim Sylvia missed the heavyweight limit when he tipped the scales for his ONE FC 9 bout. Check out exclusive photos and complete results. All fighters who underwent drug testing earlier this month at UFC on FX 8 passed their tests, the UFC and Brazilian MMA Athletic Commission confirmed. While the country has long been on the organization's radar, the UFC today announced a significant step toward a presence in Mexico, as well as other Latin American countries.